One of my favorite talks at the Indie Games Summit - at least through Tuesday - was Jason Rohrer laying down the line. What line? The line between videogames and art as most people accept it. To Rohrer - an art game developer who took the Innovation (Nuovo) Award at last night's Independent Games Festival Awards for Between - how we cross that line involves discovering what makes games unique as a medium, and not just trying to get closer and closer to film, "This kind of thing is really hurting instead of helping games with their legitimacy problems because, you know, if [they] got there and they were just as good as movies, what have they accomplished? We've already got movies." Rohrer makes an observant parallel between the way that film has come a long way from imitating theater, and points out some art games that are "using game mechanics as some sort of direct vehicle for artistic or creative expression." In effect, they're games that "could only really exist as [games.]" He doesn't see this as breaking through quite yet into art, though. He moves to say that Ebert is "the one guy in the world who has done more to advance the medium than anyone else," since he has some legitimate arguments that can eventually be beaten. It's just a matter of what game to show him. Changing tack a bit, Rohrer brings up some theory ideas about how most games (board, card, etc. included) are for multiple players. Should a good game have infinite replayability via conditions that emerge from such a setup? Single player games like Peg Solitaire are really more like puzzles, Roulette is up to chance, and early arcade games have the "reflex challenge" hook. 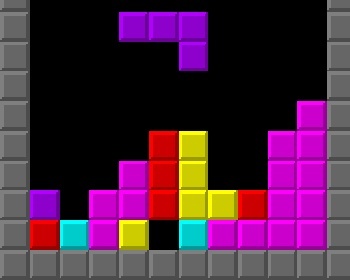 Tetris - obviously a very popular game - combines all three elements into something very compelling, but perhaps not quite art in the sense Rohrer is aiming at here. On the other hand, art games have infinite interpretation, but don't really stand up to much repeated play. He points out that the fact that games with great interlocking mechanics have the potential for complexity, but that players will still aim for the "steepest descent" and make it more about a winning strategy than the depth of possible variation. Where did the single player trend come from anyways? Tech limitations? The fact that people are usually alone on a computer in the first place? Rohrer is interested in making multiplayer more than just a feature found in every FPS, " We essentially have a reflex challenge, but for multiple players ... We sort of miss the starting mark, we miss what's cool about multiplayer in the first place, that deep emergent back-and-forth, question-and-answer kind of thing ... We're the only medium that can potentially require multiple participants..."